After the events of February 7th 2012, today, the 30th of August marks one of the darkest days in the Maldivian history after the historical elections held in 2008 which ousted the long term dictator President Maumoon Abdul Gayyoom. The road to democracy wasn’t an easy one, a path that was filled with many a hurdle than one would have dared to think of as the one soul who stood up from the masses i.e. President Mohamed Nasheed braved imprisonment, banishment and many other forms of torture in jail way before the movement gained momentum. When February 7th of this year rolled in, it was with a heavy heart and a bleeding soul that I watched on, shocked and appalled by the heinous crime that corrupt politicians and money hungry businessmen of this country had all joined together to execute, a coup that has apparently ‘fooled’ not just the Islamists of this country but rather a large chunk of the whole world as well. India and the USA, the biggest mockeries to modern democracy were the first to accept the ‘new’ government in place, not so surprising about India when they would go to any lengths to protect their interests in this country. 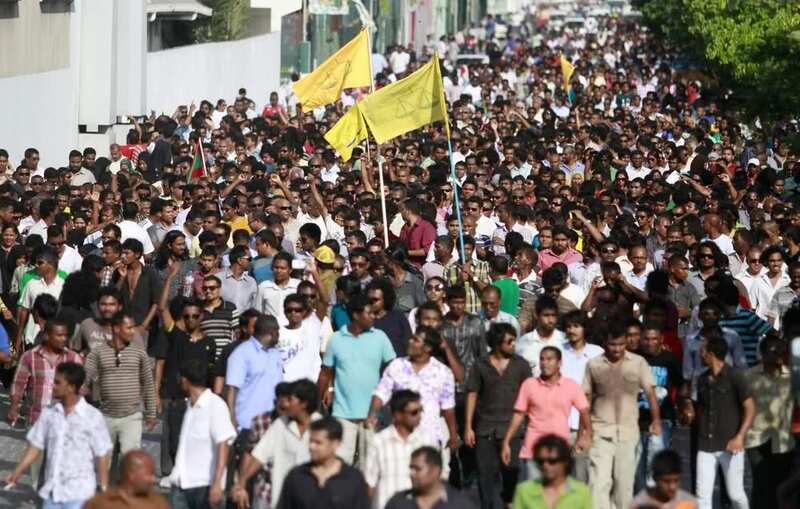 On the 8th of February, the fight for freedom once again started with a passion; people took to the streets with the ousted President leading them and the day would go down in Maldivian history as one of the worst days of police brutality this country ever saw. The mayor of Male’ City himself as well as President Nasheed were dragged through the streets as if they were common thugs and Parliament Member Mr. Reeko Moosa Manik was practically beaten to death which were some of the notable atrocities committed by the Police that day, which was later blamed on them being “overcome with passion” for the lack of a better term by the Human Rights Commission of the Maldives themselves. The saddest thing of all that strikes my mind is how miserably we have failed as a nation and as people who follow a religion that advocates peace above everything else. 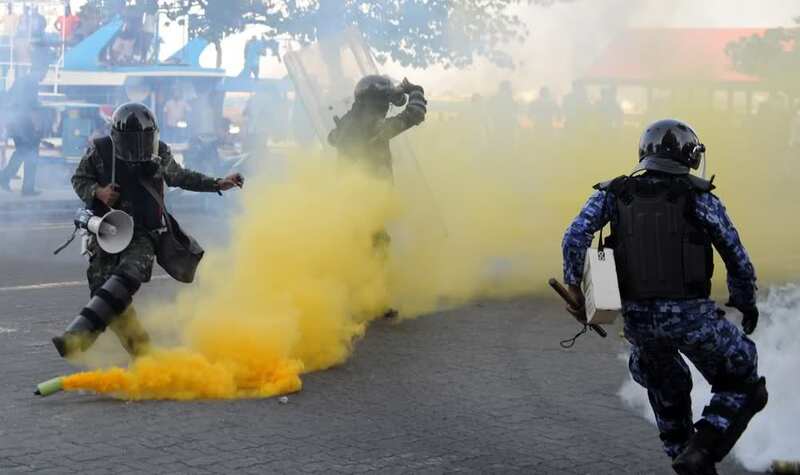 The Maldives and her institutions that should have guarded the democracy that was at its infancy all failed irrevocably leading to this day where the hopes and dreams of those who advocate for people’s rights and freedom for all once again have received a huge deafening blow. The human ability to hope in times of great adversity is one factor that would always separate us from the rest of the species. It is our ability to hope that makes us work that much harder on achieving the unattainable and it is this hope that deals us with the most crushing blows when they all come tumbling down. While the events of the coup that took place on February 7th was telecasted live on all TV channels in the country, those who weren’t deaf, dumb and blind saw it as it was. That it was indeed a coup d’état that ousted President Nasheed from power and that yes he was under duress when he resigned from office before his 5 year term was up. 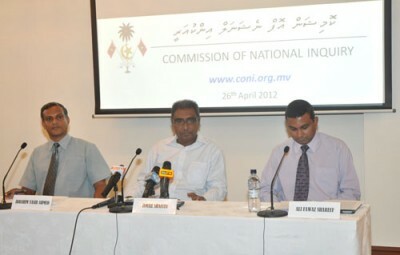 The Vice President then, Dr. Mohamed Waheed Hassan Manik who assumed office on the same day itself quickly set up a farce of a Commission of National Inquiry (CoNI), to look into whether the transfer of power from President to Vice President on that fateful day took place through constitutional means or not. A lot of dillydallying, not to mention accusations being hurled back and forth later with the intervention of the Commonwealth, the CoNI was reconstituted to suite all parties involved and thus began to flicker that small flame of hope with it that with CoNI’s investigations, it would bring to light just how much of our rights as citizens of this country had been raped and trodden upon by the rogue police and military of this country controlled by none other than the ousted dictator Maumoon himself. Even though I myself knew better, even then there was a part of me that believes in the inherent goodness of the people that made me hope that CoNI’s findings and their report would give to the people a respite from all the questions that remain unanswered to this day and show to the world the true face of the politicians who had thought of nothing but themselves as they had shamelessly used whatever means within reach to execute a ‘unique’ coup as our very own Dr. Hassan Saeed, “Advisor to all Presidents” calls it. From the smirk on Dr. Waheed’s face to the smug look on the Defence Minister Mr. Nazim’s face and the relieved looks on the faces of the rest of the cabinet and members of the “alliance” rallying behind Dr. Waheed and his farce of a government, it was apparent from the minute the press conference went live at The President’s Office that our faith in CoNI’s findings were about to be crushed big time. And crush it it did, once again rendering the majority of this country that believes what took place on February 7th to be illegal to look as fools for doing so! To the deaf, dumb and blind members of the CoNI, excluding Mr. Gahaa Saeed who had the grace to resign and let the people know that his conscience does not allow him to be a part of such a farce of a report, I would like to say, well done. You have managed to severely cripple the country and her people with your deadly report, crushed our hopes and driven us into deep despair over the lack of public interest shown in the report itself. You’ve managed to remove pertinent details, not surprising when the report was drafted by the Singaporean Judge Selvam who managed to do so while holidaying back in his country, and given us all a narrative story of how things went down and concluded that everything in fact happened as per the constitution of the country. You have managed to do something for us that no other country in the world has ever achieved to do – you have legalized the change of government through a coup d’état, and concluded that you find nothing wrong with having a President resign under duress. And bravo for managing to call us, the people, dumb fumbling idiots while you were at it because in actuality that is what your report signifies. While the stupid imbeciles of this country, and I say this with the utmost respect, go on celebrating the fact that a dangerous precedent has now been set in this country, I bow my head down in shame; shame that a percentage of the educated youth of this country still believe that Maumoon is a God unto which the rest of the Maldivians belong to while on the same breathe they conclude that there is no God but Allah. 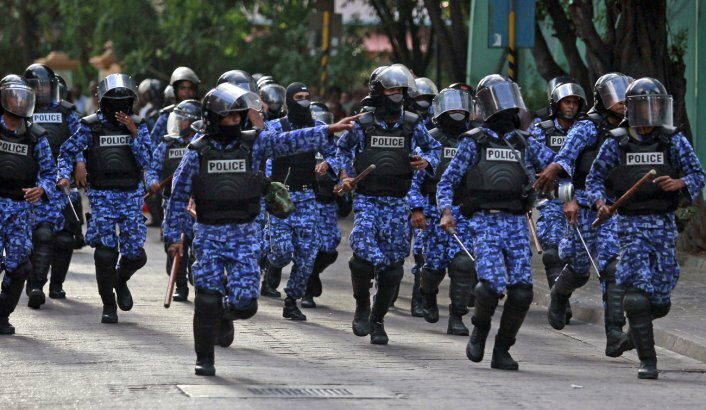 While I let the tears of despair fall, I know that kindred souls out there all feel the same way which is my only saving grace as the day that crushed something vital inside of me disappears into the night, heralding with it the arrival of the dawn of another day in the Police State of Maldives. This post is dedicated to everyone who felt the same crushing blow I did today when Dr. Waheed came out with the CoNI’s findings with that gloating look on his face – this one’s for you! Never give up fighting for what’s right. The road to justice is always a tough one. And hope, in its most virulent form, always lives on.